In Assault, the player controls a futuristic tank, attacking the surface forces of an alien environment. Assault’s main draw was its innovative controls and perspective. The tank is controlled by two four-way joysticks. The standard movements, such as “forward” and “turn left”, are executed in the same manner as with other tank games, such as Battlezone (i.e. push both joysticks away for “forward”, pull the left joystick towards and push the right joystick away for “turn left”). But since the joysticks were four-way, two other moves could be executed. Pushing both joysticks away from one another (i.e. the left to the left and the right to the right) caused the tank to rear up towards its back end for a moment. When in this position, the player could fire a lethal nuclear blast instead of the standard shots when in the normal position. The tank returned to normal driving by pressing the joysticks back together, or by waiting a few seconds. If both joysticks were pushed right or left, the tank would roll (or strafe) to that direction. Another innovation with this game was the perspective. 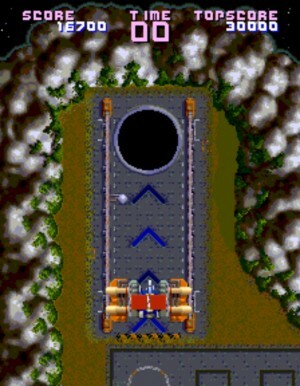 While the overhead perspective was not new, the game kept the player’s tank centered in the screen while the playfield rotated about the player’s tank. Presented this way, the tank felt more maneuverable and lifelike. One additional innovation was the way the tank entered and left the battlefield. The tank was airdropped from above, but instead of the tank falling from the sky, the battlefield appeared to come up towards the tank. When a level was completed, the tank would raise above the surface and then drop through a hatch in the ground. These methods of entering and leaving reinforced the player-tank centric approach of the game. The player battles 11 waves of enemy forces (with certain versions allowing the player to begin on Stage 6). After the final level, the player is rewarded with a list of schematics of the player’s tank, and a final screen stating “Thanks for your play”.